Figure A. RPE conjugated Mouse anti Human CD19 (MCA1940PE) and FITC conjugated Mouse IgG2b isotype control (MCA691F). Figure B. RPE conjugated Mouse anti Human CD19 (MCA1940PE) and FITC conjugated Mouse anti Human CD20 (MCA1710F). All experiments performed on red cell lysed human peripheral blood gated on lymphocytes in the presence of Human SeroBlock (BUF070A). Figure A. FITC conjugated Mouse anti Human CD19 (MCA2495F) and Alexa Fluor 647 conjugated Mouse IgG2b isotype control (MCA691A647). Figure B. FITC conjugated Mouse anti Human CD19 (MCA2495F) and Alexa Fluor 647 conjugated Mouse anti Human CD20 (MCA1710A647). All experiments performed on human peripheral blood lymphocytes in the presence of Human SeroBlock (BUF070A). Detection of Mouse anti Human CD20 (MCA1710) in an immunohistochemical analysis of acetone fixed, frozen human tonsil section detected using the Histar Detection Kit (STAR3000A). Mouse anti Human CD20 antibody, clone 2H7 recognizes the human CD20 cell surface antigen, a 33-37 kDa non-glycosylated phosphoprotein. The CD20 antigen is expressed during pre-B-cell development. It is present on both resting and activated B-cells but is lost prior to terminal B-cell differentiation into plasma cells. The epitope recognized by clone 2H7 has been mapped to the following sequence found in the large extracellular loop of human CD20: YNCEPANPSEKNSPST. Furthermore it appears that Mouse anti Human CD20 antibody, clone 2H7 only recognizes human CD20 in its native oligomeric form (Polyak et al. 2002). Purified IgG conjugated to Alexa Fluor® 488 - liquid. Purified IgG conjugated to Pacific Blue® - liquid. This product should be stored undiluted. This product is photosensitive and should be protected from light. Avoid repeated freezing and thawing as this may denature the antibody. Should this product contain a precipitate we recommend microcentrifugation before use. This product should be stored undiluted. Storage in frost-free freezers is not recommended. Avoid repeated freezing and thawing as this may denature the antibody. Should this product contain a precipitate we recommend microcentrifugation before use. Use 5ul of the suggested working dilution to label 106 cells or cells or 100ul whole blood. Lifson, J.D. et al. (2001) Role of CD8(+) lymphocytes in control of simian immunodeficiency virus infection and resistance to rechallenge after transient early antiretroviral treatment. J Virol. 75 (21): 10187-99. Cragg, M.S. et al. (2003) Complement-mediated lysis by anti-CD20 mAb correlates with segregation into lipid rafts. Jaramillo, M.C. et al. (2009) Increased manganese superoxide dismutase expression or treatment with manganese porphyrin potentiates dexamethasone-induced apoptosis in lymphoma cells. Teeling, J.L. et al. (2006) The biological activity of human CD20 monoclonal antibodies is linked to unique epitopes on CD20. J Immunol. 177 (1): 362-71. Chan, H.T. et al. (2003) CD20-induced lymphoma cell death is independent of both caspases and its redistribution into triton X-100 insoluble membrane rafts. Greig, B. et al. (2014) Stabilization media increases recovery in paucicellular cerebrospinal fluid specimens submitted for flow cytometry testing. Cytometry B Clin Cytom. 86: 135-8.
van den Akker, E. et al. (2010) The majority of the in vitro erythroid expansion potential resides in CD34(-) cells, outweighing the contribution of CD34(+) cells and significantly increasing the erythroblast yield from peripheral blood samples. Polyak, M.J. et al. (2002) Alanine-170 and proline-172 are critical determinants for extracellular CD20 epitopes; heterogeneity in the fine specificity of CD20 monoclonal antibodies is defined by additional requirements imposed by both amino acid sequence and quaternary structure. Jaramillo, M.C. et al. (2015) Manganese (III) meso-tetrakis N-ethylpyridinium-2-yl porphyrin acts as a pro-oxidant to inhibit electron transport chain proteins, modulate bioenergetics, and enhance the response to chemotherapy in lymphoma cells. Free Radic Biol Med. 83: 89-100. Kohler, S.L. et al. (2016) Germinal Center T Follicular Helper Cells Are Highly Permissive to HIV-1 and Alter Their Phenotype during Virus Replication. J Immunol. 196 (6): 2711-22. Grobárová V et al. (2016) Quambalarine B, a Secondary Metabolite from Quambalaria cyanescens with Potential Anticancer Properties. J Nat Prod. 79 (9): 2304-14. Cecchinato, V. et al. (2017) Impairment of CCR6+ and CXCR3+ Th Cell Migration in HIV-1 Infection Is Rescued by Modulating Actin Polymerization. J Immunol. 198 (1): 184-195. Popov, J. et al. (2017) Unique therapeutic properties and preparation methodology of multivalent rituximab-lipid nanoparticles. Eur J Pharm Biopharm. 117: 256-69. Hultin, L.E. et al. 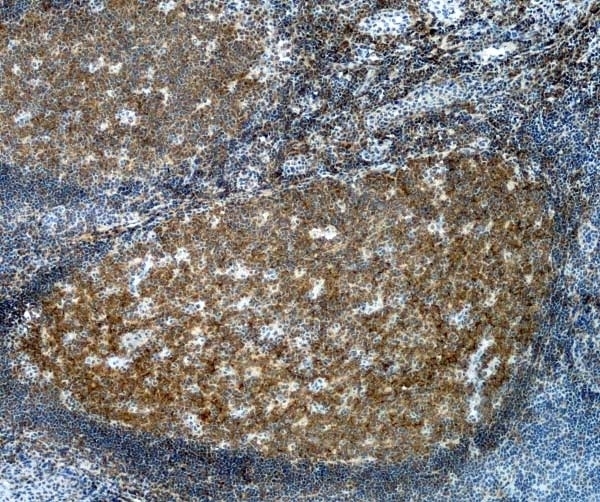 (1993) CD20 (pan B cell) antigen is expressed at a low level on a subpopulation of human T lymphocytes.